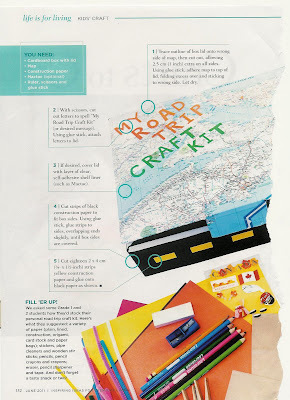 Here are some ideas - mostly from Canadian Living - to keep a smile on your face during long car rides! First of all, subscribe and download your favourite free podcast - my children's poetry podcast, of course: The Carrie Heyes DooPod! Laminate a piece of paper to colour on (using washable markers or crayons), eliminating using tons and tons of paper. (bring a cloth to wipe it off between uses). Or just buy a white board! Make a travel kit for your road trip - cover a box with a map of where you're going and you can follow your route along the way, marking places you stop to eat, sleep and do fun things! 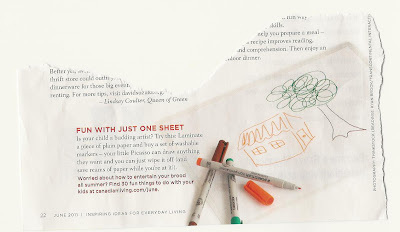 Then fill your box with your laminated paper and markers, beads and string, crossword books, magnifying glass, stickers, a deck of cards, novels/picture books (how about Doodads?!)... And don't forget treats! Have you played the alphabet game in the car? Find a written word that start with the letter A (look on street signs, cars, road signs, store fronts etc.). When you find that, move on to B then C... work together, because it can take a long time to find a word that starts with X! Write a story or keep a journal of your adventure!